In an industry where artistic recognition rests on developing a signature style, Everything Everything have paradoxically built a following through the unpredictability of their sound. We speak to the band about audacious R&B, distance from the franticness of their debut and personal reflection on their former incarnation of "gobbledlygook speed metal". In an industry where artistic recognition rests on developing a signature style, Everything Everything have paradoxically built a following through the unpredictability of their sound. 2010 debut Man Alive defied and devoured genres, reconstructing elements within a single track. Their second album Arc responds by moderating chaos for the creation of harmonies. "It's sort of like working through the stages of grief, starting off angry and confused, becoming sad and wistful and right at the end there's a resigned hopefulness," says singer Jonathan Higgs of the album's pace. He's with bassist Jeremy Pritchard and drummer Michael Spearman as we enjoy our own private sad party in Manchester's Northern Quarter. Arc is the kind of sweeping postmodern survey of social and personal dissection for which Everything Everything is justly celebrated and in many ways it is a perfect sequel to Man Alive. "We feel much braver and more confident about everything than we did the first time around," Jonathan notes. "I think the further away we get from Man Alive and the more we compare Arc to it, Man Alive was like a bullied freak at school, where everything was on the outside. It was very defensive about being unusual and tight-lipped about the why's and what's." Michael elaborates, "and not wanting to be pinned down. Lyrically people couldn't really tell what it was about and musically we also tried to stay away from clichés so much, which I guess is honourable but not sustainable." The stripping away of distraction seems to have taken precedent second time around. "Definitely; and to make it more of an emotional record," Jonathan says. "Arc is musically clearer and lyrically it should be far easier to tell what I'm talking about or at least to gather the right emotional response to it. We talk about Man Alive like it was a bag of wires, but it wasn't and isn't. There are definitely some very straightforward moments on it." Michael reflects, "but as an album Arc is more introspective than Man Alive." It's interesting that the band considers Arc a more introspective album when everything that accompanies it is outward facing. Arc's album artwork was shot by revered photographer Nadav Kander. The series of portraits make for an arresting image, unified in sombre radiance in an attempt to make a physical connection with the listener. "He's a consummate artist and really did give us our motivation," Jeremy says, while Jonathan reveals, "we put the record on while we were setting up [to shoot the cover] and I shed a tear when 'Duet' was played as it was pretty soon after the record was finished. I didn't let anyone know as we were in a very unemotional environment but he must have spotted me, or he could see it as he didn't give me any direction. I can tell in that photo that I had been crying recently but I don't think anyone else can." Arc is thrilling in its visceral honesty with a sound that finds cohesion in narrative logic, rhyme and harmonic structure. However, the wry humour and irony conceived in Man Alive lingers. "I think you have to work hard to get the humour," Jeremy offers. "There's a lot of humour in Kraftwerk's work but you wouldn't look at that band, who are ultimately po-faced and say they are comedians." Jonathan elaborates, "it's less overt and darker. There's word play but it's not just for the sake of it now. In Man Alive there was stuff that was just nonsense now and again because it rhymed but there isn't really anything like that in Arc. In 'Kemosabe' there is 'eternal monologuing' as in internal monologuing. The play is that it is an eternal soliloquising." Arranged loosely by concepts of social nihilism and personal introspection, Arc represents a colossal feat of orchestration by the band. Highlight of the record is 'Undrowned'. The track captures Higgs speaking to his younger self as coherent worries gather pace, its herculean intensity reduced to animal instinct. "Yeah absolutely, I think 'Undrowned' is like that," Jonathan says. "There was an idea for a song I wanted to make that was a madman walking with just the sound of the street and ending up singing and shouting. I've still got the words for that song, no one has even heard it yet. I think 'Undrowned' gets the same thing across without being a performance piece." Jeremy continues, "'Undrowned' is a centrepiece to the record in terms of its mood and attitude. 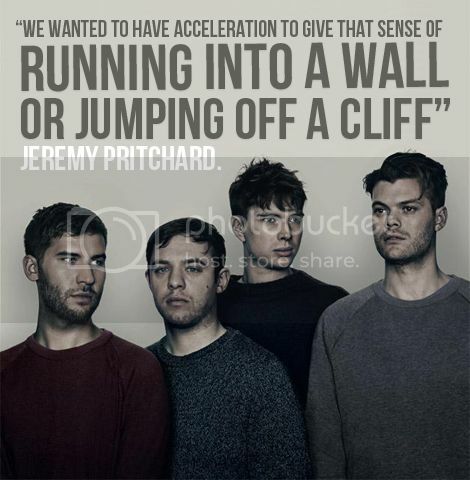 We wanted it to have a slight acceleration to give that sense of running into a wall or jumping off a cliff." Throughout Arc Jonathan's voice omits expressive falsettos and quiet irreverence, trading the lyrical glossolalia of Man Alive for more surefooting. Kraftwerk influences the band amongst more progressive quarters but as children of the 90s, R&B is familiar territory. "There's something about audacious things that definitely appeals to us, like Destiny's Child and R Kelly that gives you a sense that there's no limits," Michael explains. "I think it's the feeling of 'did they just do that?' that I love," Jonathan says, and adds "it's often absurdly complex and virtuosic and the literal message of something like 'I tried my best to quickly put my phone on vibrate' is sung in way that sounds like his [R Kelly's] mother is on her deathbed." Residual R&B moments permeate through the group's output. "One of the things I enjoy about my own lyrics, if I'm allowed to, is throwing up extremely casual slang against high brow stuff," Jonathan says. "An example would be 'nuff genuflecting in a penitent way'. I love in R&B when you get an extremely sincere sentiment but its presented in a casual way." "And cheapness," Michael suggests and says, "sometimes something will sound very cheap but the sentiment behind it is genuine." Jonathan quietly interrupts singing hanging out the passenger side of his best friend's ride before Jeremy joins trying to holler at me. Higgs has considerably tightened the band's stylistic brackets and perhaps in keeping with Arc's performance-centeredness, has deftly insinuated a confident onstage persona. They're no longer hiding behind impenetrable lyrics and amongst internal codes and rhythms. With Man Alive you would be forgiven for thinking you couldn't keep up; rather you were kept out." Arc is a more revealing sound and all of these things are linked. We've got a new member to play keys so I'm not behind my keyboard now. There's no literal barrier and I'm not stood still having to play with one finger in this charade of keyboard playing that I was doing," Jonathan says. Arc finds order amongst internal contradictions: hopeful and melancholic, detached and immediate and echoes a band at ease with conflict. The particular appeal of this pensive mood led the band to dub it the 'sad party vibe'. "I think the spirit of the lyrics [in 'Duet'] and something about the uplifting sadness of it is captured exactly as I wanted it, more so than anything else I've written," Jonathan reveals. "I've always found 'Dancing Queen' by ABBA to be nostalgic and incredibly sad," Jonathan says. "Often, there is nothing inherently sad about the harmony of a sad party song, it's something to do with the passing of time for me. We tried to capture the sad party on pretty much every song on Arc." If Man Alive was inventing abstraction, crammed with as many ideas that would fit, then Arc is a challenge to create a crystalline sound within a three and a half minute song. "In terms of experimenting it almost feels as if we don't have time – literally time on a record. 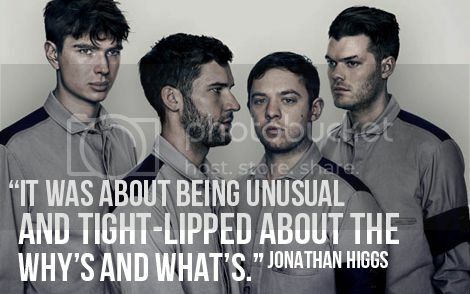 I think the real challenge is to achieve that in the pop and album format," Jonathan says. Arc could be the soundtrack of a band coming to terms with expressive restraint but how do they feel about their debut, in retrospect? Jeremy knew he wouldn't enjoy remaking Man Alive adding, "it would be an effort these days to ape that style." "Also hearing yourself. When you get a two-year distance from your own work and then hear 'Photoshop Handsome' on the radio I was thinking, who the hell is this? Shut up," Jonathan exclaims. So was Arc the process where Everything Everything learned to shut up a little? "Yes, that's a good way of putting it," Jeremy says. "But it's still there and that won't ever go away - that iconoclasm." "There's just no point in making another record of gobbledygook speed metal," Jonathan says to collective laughter and continues, 'we always said there's no point in re-treading ground; we're going to re-tread everyone else's." Arc is a record that communicates a band embracing worldliness and at times, withdrawing altogether. "We have our own world now that we're kings of. We don't have to latch on to anyone else's or fit into a niche that isn't there," Jonathan says sagely. "We have our niche and it's Man Alive." The message is the medium and Arc delivered it loud and clear: last week Everything Everything broke out of the fringes and into the mainstream with the album charting at No.5. Whilst faux-folk rurualism and generic pop warblings might not be dead, they are mindless and boring. Long live Everything Everything.